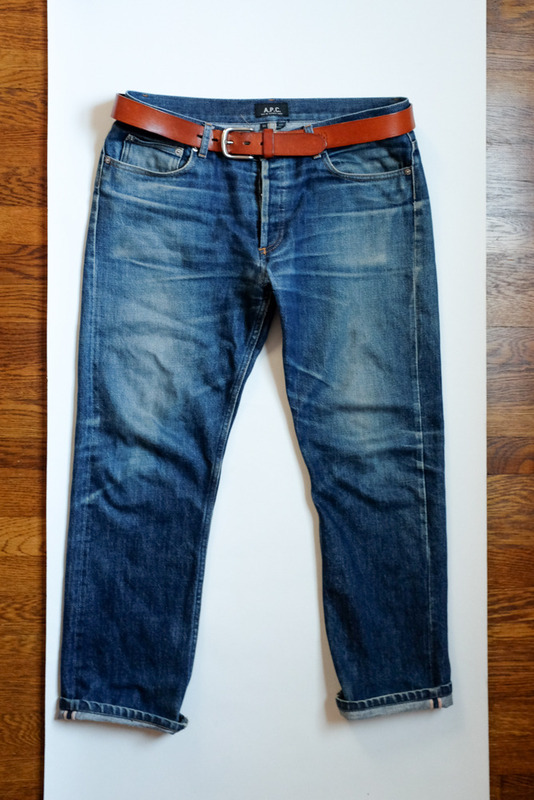 Because not enough readers find Put This On while googling “close up crotch damage”, I wanted to offer this testimonial to the good work done by New York’s Denim Surgeon on my most-often-worn jeans, a pair of APC Petit Standards I’ve had since spring 2011. My dry cleaner, bless her heart, patched the worn-out crotch twice but the patches were weak and this is a high-stress area. 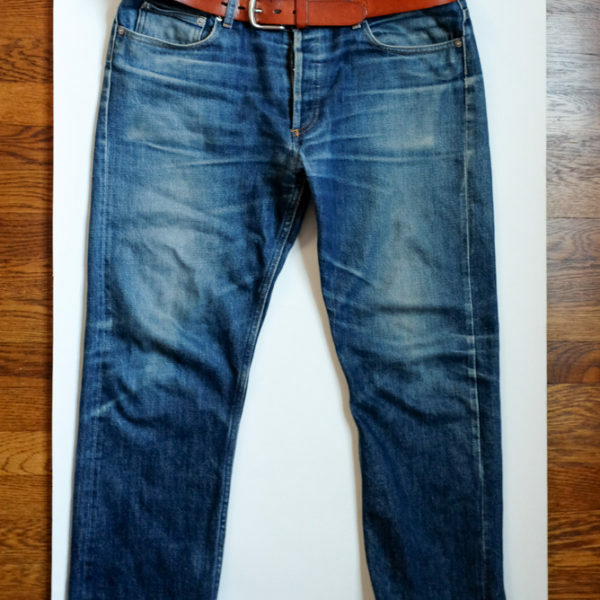 I chose Denim Surgeon after reading Derek’s post on quality denim repair and reading a recommendation for them on Superfuture’s Superdenim forum. I mailed in my APCs as well as a pair of 5EPs with a similar blowout plus unraveling hems and torn-up pocket bags. 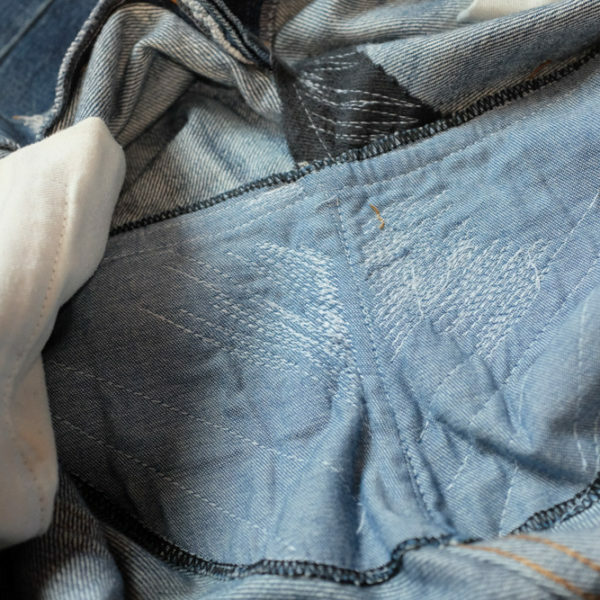 I used Denim Surgeon’s repair form to specify areas to be surgeon’d (some people like to preserve wear-and-tear that others might want fixed, so it’s best to be specific). Two business days after my jeans were delivered to their location in New York, I received a Paypal invoice, which recommended crotch repair and reinforcement for both pairs, at $75 each, plus $10 for pocket bag repair on the 5EPs, and $9 shipping. Not cheap, but potentially better than taking them back to the dry cleaner every few weeks. I paid immediately and the repair work took about a week. 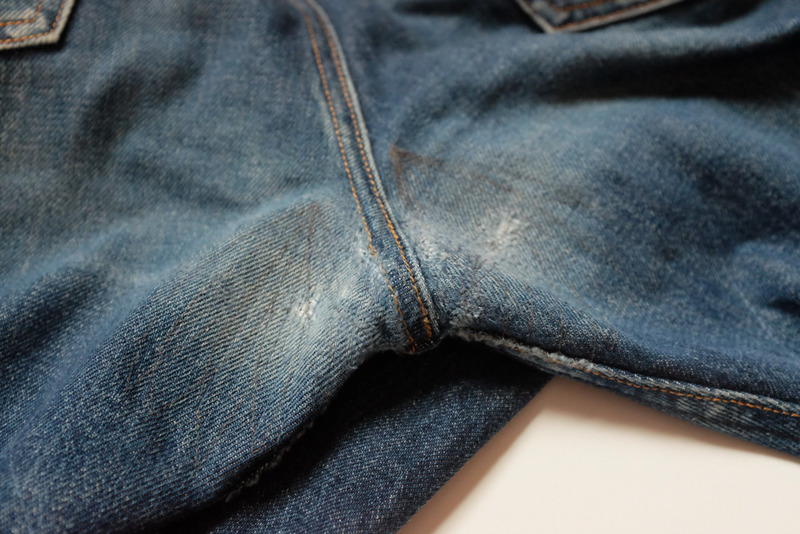 The work they did was significantly more involved than the small patch jobs the jeans had before. Denim Surgeon placed a large fabric patch inside the APCs, shaped a little like the reinforced seat you see on some BDU-type pants. The edges of the patch are flatlock stitched to prevent fraying and the whole thing is stitched to the jeans at the edges and with zig-zag stitches across the patch. They darned the threadbare/torn areas and re-sewed the main seam (where all four denim panels come together) with color-matched thread. From the outside, you can barely notice the patched area, unless I’m doing cartwheels, which I would feel fully confident doing in these jeans. The 5EP pair was repaired similarly although with a smaller patch. The only concern I’d have would be with sending a particularly tight pair of jeans in for this sort of repair, because the patch is heavy enough it could conceivably affect how they fit. Denim Surgeon currently offers a Groupon discount. 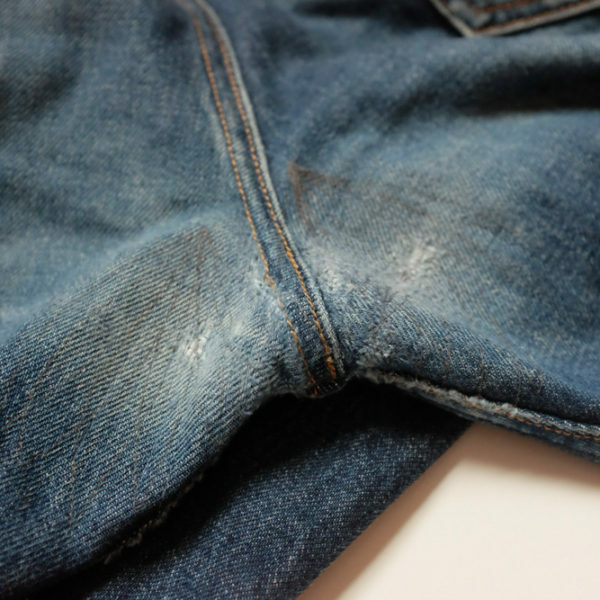 It’s a nice deal although if your jeans are significantly damaged, it likely won’t cover the total cost of repair. 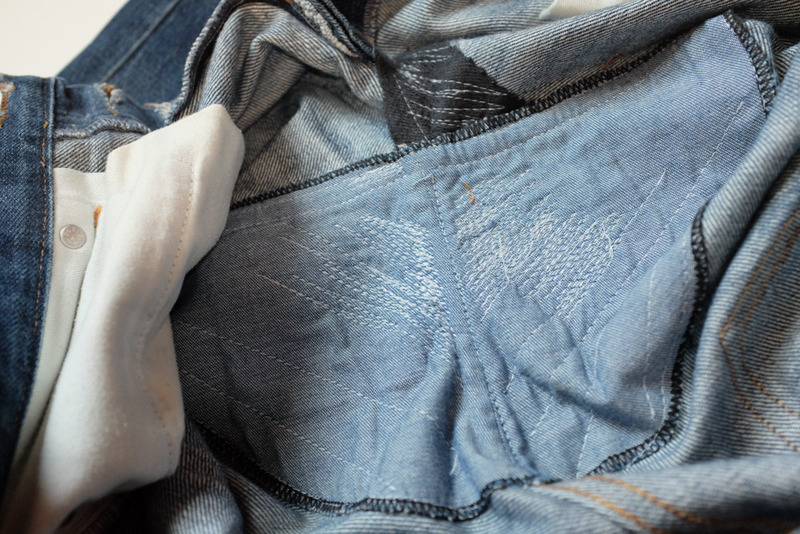 Note: Because of a discrepancy between my billing and shipping address, my jeans were held by Denim Surgeon after repair and before shipping (they were set to ship a week after payment, but did not leave New York for another week). Their communication about the issue was good via email and phone, and they sent me $25 credit toward future repair. At no time did I tell Denim Surgeon I planned to write about their service for Put This On.